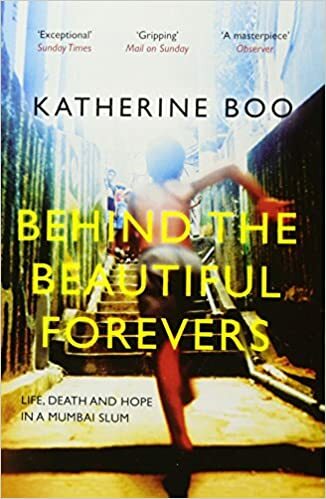 A scintillating piece of narrative non-fiction by the Pulitzer Prize winning Katherine Boo, “Behind the Beautiful Forevers”, has at its bedrock the squalor, sentiments and sanguine atmosphere surrounding the sprawling Annawadi slum in the glitzy Metropolis of Mumbai, the financial nerve centre of India. Squatting behind the glamorous 5 star hotels and the renovated International Airport, Annawadi is distinguished by its perpetual qualities of stench, smoke and sewage borne diseases. But the slum is also home to numerous downtrodden people who hope to make it big someday thereby unshackling themselves from an existence of misery and pity. This struggling horde come alive in the incandescent words of Katherine Boo. In a reportage that transcends mere factual dissemination, Boo paints an ethereal picture of a world that seeks selfishly exploits sympathy and thrives on misfortune and mistrust. Abdul Hussain, an enterprising and introverted scavenger is the son of Karam Hussain and Zehrunisa. With an inveterate drunkard for a father and a foul mouthed impetuous mother, Abdul at sixteen is the unwitting and forced sole bread winner in a family that numbers eight. Braving rat bites and obnoxious fumes, Abdul diligently sorts his accumulated heap of garbage for selling the same to recyclers. Asha, a low ranking worker in the Shiv Sena political party aspires to be the ‘slum-lord’ of Annawadi in future. To this end, she develops valuable associations and influences by selling both her intrepid mind and not so young body. Manju, Asha’s benevolent and soft spoken daughter hopes to become the first ever female graduate to pass out from the cesspool of Annawadi. Fatima, a fount of abuse and the nearest neighbour of Zehrunisa, is a crippled woman who does not allow her disability to come in the way of her scheming means. Gaudily dressed and with a cunning eye, Fatima doubles up as a prostitute, recklessly offering herself to whoever is willing to take her. Sunil, is a lanky young fellow scavenger who having learnt the tricks of the trade from Abdul and a fellow rubbish scourer, Kalu, goes to precarious corners abutting Annawadi to seek and possess plastic cans and ketchup bottles. An unfortunate but seemingly innocuous quarrel between Fatima and Zehrunisa shatters the relative peace and quiet of Annawadi when the one-legged woman douses herself with petrol and sets herself on fire. Abdul and Karam are unfairly booked for attempted murder and the unscrupulous cops begin a witch-hunt sending the Hussain family to the very depths of hell. Katherine Boo exposes the wicked and rotting underbelly of corruption that encompasses within its fold petulant police officers, callous corporators and malevolent missionaries. As the helpless and hapless Hussain family runs from pillar to post, Boo explains in meticulous detail a failed justice system that has as its unyielding tenets procrastination and prevarication. But the most captivating and melancholic aspect of the book is its setting which is the very picture of clash of contradictions. On the one hand there is uncontained affluence in the form of the glamorous Hyatt with its glazed glass; the remodeled terminals of the massive International Airport where hoardings scream out at travelers the words “Beautiful Forever”; on the other hand there is the unrivaled poverty stricken and disease ridden slums of Annawadi where people are forced to stew rats and monsoons result in a sewage lake overflowing into various pathways. “Behind the Beautiful Forevers” is as close to providing an understanding of the twin faces characterizing second fastest growing economy in the world as one can hope to glean. A resurgent India striding like an invincible colossus still grapples with a recriminating India whose hidden wounds fester in an ocean of neglect and nepotism. The overwhelming march of progress is sullied by an overbearing attitude of callousness that treats as trivial the loss of lives, limbs and livelihood. More than anything else it also provides a golden opportunity for the powers to be to atone for their callousness and undertake an act of redemption that will free an untold mass of humanity from the fell clutch of wanton wretchedness and woe. “Behind The Beautiful Forevers” – An eternally haunting song of heartache and hope!